And yes, I've read a fair number of books since Memorial Day. It turns out that 2014 has continued to be my readingest year since childhood. At not quite halfway through the year, I've read nearly as many books as I did all of last year. This can be almost entirely attributed to engaging in far less writing and revising. Since my own books have been in the querying and planning stages, I've had a lot more time to enjoy books by other people. 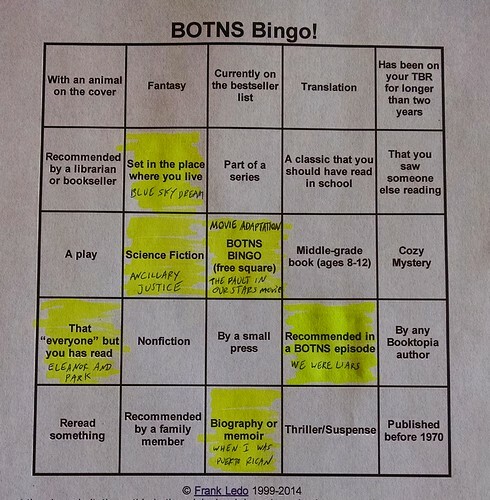 I want to be sure to fill up at least one line of my summer reading card so I can score a bingo, but I'm more interested in seeing how much of the card I end up covering. I'll report back at the end of the summer. In the meantime, consider getting started on a card of your own! → At the New York Times Opinionator blog, Pamela Erens pays tribute to The Joys of Trimming: "What the editor thought would take me a few months ended up taking me two years. Every time I changed one scene of the novel in order to get it in line with the new idea, something else called out to me to be changed too. I eventually rewrote the book from first word to last. Strikingly, all this revision made the manuscript shrink."